Proactol Review: Is it Safe? Proactol is a fat reducer that works primarily by keeping fat from being absorbed in the body, in addition to incorporating a soluble fiber that enables the body's digestive system to digest food more gradually, providing the stomach with a feeling of satiation for a longer period of time. Proactol's fat reduction technique works by incorporating a fiber that binds to the fat you eat. This ensures that the fat is excreted along with the fiber as opposed to being stored in the body. Additionally, this technique also means the body takes longer to digest the fiber and therefore Proactol keeps the consumer feeling fuller for longer. The key ingredient in this whole process is Opuntia ficus indica, an extract of the cactus plant. Clinical trials suggest this ingredient is responsible for all of the aforementioned weight loss benefits. However, does Proactol really work? For one, unfortunately Proactol does nothing to block the absorption of carbohydrates. Therefore, if you enjoy bread, pasta, or any other carb-laden food, unfortunately Proactol will likely have no effect. 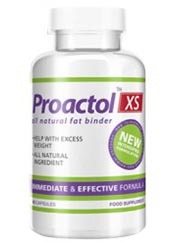 Another concern is the way in which Proactol keeps the user from absorbing fat. Note: This is not pretty. Positively affects the absorption of fat by binding it with fiber, possibly reducing hunger too. Side effects. The more fat you eat the more fat will be exiting your body along with the rest of your stools. Constant restroom trips may result. Moreover, the product is very expensive, costing about $80 for a one month supply. As mentioned earlier, seeing as Proactol mainly attaches excess fat to fiber to keep it from being absorbed in the body, this means all the excess fat your body would normally store is going to be excreted through the bowels. This could mean sudden, unexpected trips to the bathroom, and a whole different type of stools like you have never seen before. People who fly on airplanes, spend lots of time in their cars, or just generally are unable to take regular constant bathroom breaks would most probably not last long with Proactol. Although the science behind Proactol is intriguing, it seems the product too easily glosses over the main chink in its armor: the side effects. Anytime a product merely keeps you from gaining weight by essentially flushing you out, the product is only convenient for those who can devote a large percentage of their day sitting on the toilet. Moreover, Proactol Plus only keeps the body from absorbing fat, nothing else. Therefore, carbohydrates will continue to be regularly absorbed and stored in the body, regardless of how much Proactol Plus is taken. In our recommendation, this product is far too expensive to only contain one piece of the weight loss puzzle. Although it does appear to positively block fat, it does nothing to block carbs, calories, or keep the user alert and energized. Bottom Line: One thing is clear, Proactol is an expensive way of blocking fat, and the customer should be prepared for the extra trips to both the bathroom and the bank.